Rabdi is very popular and most preferred cuisine of North India. In which, the rabdi of Mathura region is most famous across India. 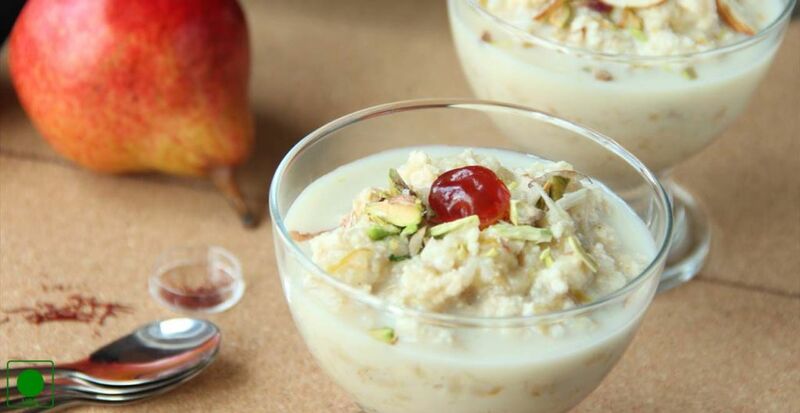 Apple rabdi is one of the famous rabdi recipe. It is eminent Indian sweet dish which is flavored with apple. This succulent and creamy rabdi is an alluring dessert and the taste of it would linger long on your palate. Here, the simple steps are given to follow the recipe. 1. In a pan, bring water to boil and when it starts boiling add cinnamon stick and 3 teaspoons of sugar to it. 2. Now, wash apples, peel off them and chop them into small pieces. Apply 1 teaspoon lemon juice to the chopped apple before they turn brown. 3. Add chopped apples to the water and cook till done for about 10 minutes. 4. Once the water completely absorbed turn off the heat and remove the cinnamon stick. 1. Pour milk in heavy bottom broad vessel and bring it to boil. 2. In a bowl, mix in the milk powder with cold water and form a paste. 3. When milk starts boiling add prepared paste of milk powder and mix well. 4. Add remaining sugar to it and simmer till reduce to half the original quantity and the milk thicken and attains consistency of rabdi. Stir in between. 5. Once it done remove from the heat and allow it to cool. 6. Take cooked apple pieces in a bowl and pour the rabdi on it and refrigerate it for half an hour. 7. At serving, decorate it with roasted dry fruits and serve chilled.